Over 90% of the shoes on the market will make your heel pain worse. That’s why choosing the PERFECT shoes is a crucial step if you truly want to get rid of your plantar fasciitis. But you have nothing to worry about! Because I’ve already spent hours of research to find the best shoes for plantar fasciitis. To make it even easier, I’ve made a table of contents for this massive guide. Plantar fasciitis is mainly caused by wearing supportive shoes. Yes, wearing shoes and orthotics weakens your feet and will cause your plantar fasciitis to come back again. Human populations that don’t usually wear shoes rarely, if ever, suffer from plantar fasciitis. 7-10 represents a “top-supportive” shoe for severe pain. 1-2 represents a minimalistic shoe. After a few months with “semi-supportive” shoes, you will want to finally progress to minimalistic shoes (or barefoot) to maximize your foot strength. In the last section, I will mention some of our top minimalistic shoe picks. The “neutral shoes” I will mention in this guide can fit both mild overpronators and mild underpronators. If you don’t know what your foot pronation is, at the end of this article there are instructions for a 10-second test you can take to find this out (Jump to the test). 1. The running shoes below provide the best support for severe heel pain. But I wouldn’t recommend using these as a regular shoe in the long run. Always keep them on hand for when your plantar fasciitis acts up. And then, when the pain subsides, you need to progress to a less supportive shoe with lower heel drop as I mentioned in the “how to use this guide” section. 2. Asics used to provide the best shoes for plantar fasciitis, especially their older Kayano’s. Nowadays, they are using cheaper materials and narrow toe box which is bad for heel pain. Stay away! The New Balance 1080 is one of my best picks for 2019. It has a lot of cushioning around the collar and in the footbed so this will be a very comfortable shoe to wear while walking—or running since it is a running shoe, after all. Beyond the cushioning, there is some asymmetrical heel counter to keep the foot locked into place. It will hold your foot in a healthier position while also cushioning the shock from your step so that your heel doesn’t get further inflamed. The sole design will also redistribute shock so that it’s not shooting straight through your heel. So these are an amazing choice for all day wear while you’re recovering from severe plantar fasciitis. Pros: Perfect for severe pain. Super comfortable design that protects the heel and holds the foot in place. From what I’ve found in my research, a lot of women’s running shoes have stiffer soles that make them really bad for your feet if you’ve got plantar fasciitis. So it’s a lot harder to find a running shoe for women that will actually provide the support and cushioning that you need. The Ghost model is one of the few that doesn’t have the problem. It has a softer rubber sole. Rubber is a great choice because this is a material that is solid enough to provide support but flexible and soft enough to not force the foot into a weird position. The arch support has been designedfor those with a neutral arch or slight underpronation so it has a lower arch but a bit of a firmer sole. The sole also has this nice split design from the middle down the heel that helps redistribute and absorb shock so that it spreads around the heel rather than shooting straight through it. Overall, the Ghost model is another awesome choice for severe heel pain. Pros: Great support for underpronation, great shock absorption in the heel. Cons: Still a little on the stiffer side compared to other options. The Wave Rider will help hold your heel in place and keep it protected from the shock of walking or running. But what I found really interesting about the design is that despite the stiff sole, this shoe is built with a wider, flexible toe. So this combination would allow you to minimize pain and injury while also training and strengthening your foot to prevent future injuries. You can use a toe spreader or orthotics with these which makes them a good transition shoe as well (Transition to a “semi-supportive” shoe). You can start with these inserts and then phase them out over time rather than having to buy different shoes for different stages of your recovery. Pros: A unique blend of great arch support and flexibility at the toe help to gently strengthen your foot. The Guide 10 from Saucony is better for the middle phase of recovering from plantar fasciitis. When your pain has settled to maybe a 6 or 7 (out of 10). It has a mid-range heel drop of 8mm that will help naturally encourage you to walk more on the middle of your foot rather than on your heel. This is important because striking the ground heel first is one of the most common ways people damage their feet in the first place. So this shoe helps to correct the problem. But it does that while still providing a lot of cushioning that will keep your foot protected. The sole also has a nice design that maintains flexibility while also redistributing shock around the foot rather than letting it shoot straight through the heel. In my opinion the Guide 10 could also easily become your everyday shoe to prevent problems in the future. Pros: A great everyday shoe for preventing heel pain in the long run. Awesome pre-transition to minimalistic shoes. Cons: Runs a ½ size small so consider buying a ½ size bigger. If you are sick and tired of heel pain, can’t walk far, and want immediate results, go for Z-Coil. These shoes have been designed with the goal of minimizing impact as much as possible. They’ve got a steel coil in the heel that provides the perfect amount of spring back so that you can walk (or run) without your heel ever suffering the sharp impact. While the steel coil is definitely the most unique feature of this shoe, it’s definitely not the only feature. It also has a huge amount of padding in both the heel and the toe. The toe box is wide enough to allow your toes to spread naturally. Even the sole on the bottom of the shoe is padded to further cushion against impact. And inside the shoe, you’ve got a built-in orthotic that provides the support you would expect from a plantar fasciitis shoe. These shoes provide the best support in the market. And it’s exactly what you need if you’re in serious pain from plantar fasciitis. These are designed to be the ideal recovery shoes. Pros: The best design for minimizing impact and protecting a healing foot. Cons: Looks somewhat funny for some. The Ghost model comes with a 12 mm heel drop that will give your foot a lot of support and shift the pressure away from your heel. In addition to the heel drop, it also has a lot of cushioning around the collar and in the tongue that will help to gently hold your foot in place. This is an ideal combination for the beginning of the healing process. The Brooks Ghost also provides amazing arch support for neutral to underpronation. However, I saw very positive reviews from overpronators with flat feet too. Overall, these would be a perfect pair of shoes to have on hand when your heel pain is severe. Pros: Heel drop and cushioning ideal for recovering from plantar fasciitis. The Glycerin is another “top-supportive” shoe from Brooks. It has a lot of cushioning and thick sole that is firm enough to provide some correction to your foot. And the top layer is also designed to add to this correcting and shaping. For those dealing with more severe foot pain, this kind of support is something you will appreciate. The narrow toe box, the thick cushioning and the more rigid overall structure will keep your foot protected from shock while also preventing it from rolling around. These kind of design features are incredible for someone who needs severe pain relief. Pros: Great support and protection for more severe cases of plantar fasciitis and heel pain. The Wave Sayonara 3 was made mainly for endurance training and competitions. So what that means for its construction is that it uses lighter weight materials that won’t weigh down on your foot and the sole is designed for maximum shock absorption. Unlike some of the other shoes which provide great support but tend to be thick and heavy, this shoe is better for all day wearing. Because they are designed for longer runs, they also provide more cushioning and more support. They have extra padding in the tongue and around the collar as well as a secure wrap around the middle of the foot. As I’ve pointed out with other shoes, these features make them great for your heel pain and that’s why I picked them in my research. Pros: Light weight, ideal for all day wear with extreme heel pain. The Transcend model is definitely a high support shoe that will be perfect if you’re suffering from severe plantar fasciitis. I highly recommend a shoe that features a more rigid structure because this kind of gently holds your foot in the correct position. Your heel won’t be rolling around and it will also help align the rest of your joints all the way up to your hips. As with some of the other supportive shoes, these have a lot of cushioning that help with shock absorption and comfort. But what I found really impressive were the guide rails that they have built into the midsole. These help to hold the foot precisely in the position they need to be to make walking or running less painful. Pros: Great support, foot correcting design. The 1260 Model from NB has a great design that would be ideal for an arch support shoes for flat foot (or nearly flat). They’ve got a lot of features that provide a pretty nice level of stability. And there’s a wider toe box so your toes do have some room to spread. That will help take a little of the pressure off of your heel. It also means that you can begin the process of training and strengthening your feet to prevent future plantar fasciitis problems. Another thing I noticed is that the cushioning, as well as the design of the sole, are going to help distribute the shock away from your heel so that you can walk with minimal pain. Pros: Great shock absorption, great overpronation support. Cons: For some, it’s too wide. 1. As the running shoes, the walking shoes below also provide the best support for severe heel pain. But I wouldn’t recommend using these as a regular shoe in the long run. Always keep them on hand for when your plantar fasciitis acts up. And then, when the pain subsides, you need to progress to a less supportive shoe with lower heel drop as I mentioned in the “how to use this guide” section. The Vionic Orthaheel Walker is an excellent example of all the classic features you expect to find in a supportive walking shoe. It’s wider set which provides more stability. That width also extends to the toe. The wider toe box means your toes have room to spread out. But what really makes this stand out is the removable orthotic that comes with it. The orthotic helps provide motion control and additional support in your heels and arches. It also helps to correct your stride so that you walk without placing all the impact and weight on your heel. While I was researching these, I was so glad to find out that the orthotic was removable. That means that you can take it out when the pain subsides and work on strengthening your foot to prevent it from becoming injured again in the future. Pros: Removable orthotic that provides perfect support for plantar fasciitis. Cons: May not be necessary if you already have your own orthotics. The NB W1540v2 is one of the best shoes you can choose if you are looking for something with maximum support. It is ideal for when your heel pain is at its worst and you really need something that will allow you to walk without feeling the impact of your step in your foot. The shoe design provides maximum arch support while also including cushioning all around the shoe and in the collar so that your foot is gently cradled in precisely the position it needs to be in. It also features New Balance’s effective roll bar technology to help correct your stride. The cushioning in the sole and the 10 mm heel drop are also going to help redistribute shock so that your heel is protected from the impact. Pros: Fantastic support and lots of cushioning. Cons: Available in limited colors. The WW928 is another shoe that offers a high level of support that is ideal for someone suffering from plantar fasciitis. There’s padding around the collar and in the tongue to help keep your foot and ankle in place. There’s shock absorbing cushioning inside the sole to protect your foot from the impact of your step. And it also has the highly effective roll bar technology that will gently correct your stride so that you aren’t walking in a way that worsens your pain. These are another sort of shoes that you can use when your plantar fasciitis pain is at its worst. Pros: Great support and stability. Cons: A bit heavier than other options. As you probably noticed I’m a big fan of New Balance when it comes to plantar fasciitis. It is generally a great brand to look to when you need a shoe with a lot of support and really great shock absorption. This particular design is yet another example of why this brand has become such a popular one among people with heel pain. It’s a sort of all-purpose shoe meant for walking or training. So that means it is built to provide stability and to cushion the impact of your step. It’s wide enough that you can wear it with your orthotics. And the rubber sole stiff enough to give you the arch support you need but still flexible enough to allow your foot to move more naturally. These are a bit lighter weight than many of their other high support shoes so you can wear them for extended periods of time. Pros: Maximum stability and great shock absorption. Cons: They can take some getting used to since they force your foot to distribute weight in a healthier way (This is not a disadvantage at all). 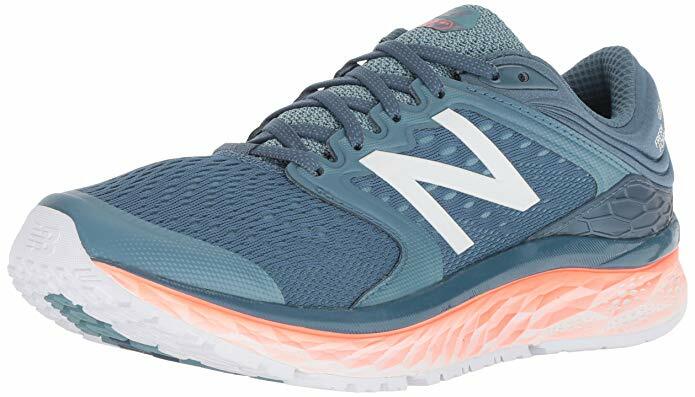 The New Balance M1540v2 is a great walking shoe that is well designed for flat feet and overpronation. This is one of the best designs for motion control that I have found in my research. It has a stiffer sole that helps hold your foot in the proper shape. And it has a roll bar to help correct your walk so that you don’t over pronate. There is also a lot of thick cushioning around the collar and in the tongue that helps to hold your heel and ankle in place. And finally, the 10 mm heel drop keeps your heel well protected from the impact from walking. So overall, this is one of the most supportive shoes you could get. Of course, with all that built in support, you do have to expect a heavier, bulkier shoe. But for severe heel pain, the 1540 model is a perfect choice. Pros: Excellent support in the heel and arches. Cons: Heavy. Available in limited colors. The MW928 is another example of the great support that New Balance shoes can offer. You’ve got the roll bar technology that stabilizes your foot and prevents you from walking incorrectly. You’ve got the thick cushioning around the collar that will hold your foot and ankle in place. There’s plenty of cushioning in the heel and mid foot to soften and distribute the shock from each step. But what I really found interesting about this one is that it is surprisingly light weighted for the amount of support that it has built into it. So it’s a little more reasonable to use it as a regular shoe even when your plantar fasciitis is gone. Although that I still recommend switching to less supportive footwear when the pain goes down. Pros: A lighter weight shoe that still offers great support. The MX608V4 comes with wider design that will provide more stability and room. That’s good news for someone who needs a little more motion in their foot (but bad news for someone who needs motion control). They can definitely be used with orthotics and toe spreaders. So you can put the orthotics in when the pain is severe and take them out when you want to train and strengthen your foot. At the same time, these seem to have great cushioning in the heel and a sole that is effectively designed for shock absorption. So, I would recommend this as a regular shoe to be worn when pain is lower or nonexistent. Or I would recommend getting orthotics that you can insert into these when the pain does become severe. Pros: Great stability and support. Cons: Not as much motion control. If you are dealing with severe heel pain avoid any sandal or flip flop for now. Instead, you should pick one of the shoes above. Among the brands below, Chaco’s and Crocs may be a better choice because of the strap in the back of the sandal. Although we placed only one image per sandal, all the sandals below are the best for both genders. Chaco makes a line of sandals with arch support that are wonderful for someone who is dealing with plantar fasciitis. They provide extra cushioning in the foot bed. And more importantly, they provide a lot more heel support than a regular sandal. They also have a lot more style and fashion sense than most orthotic sandals you’ll find on the market. That’s not an essential but I know it’s important for some, so I decided to mention this here. Pros: Good arch support and structure, includes back strap, and stylish. Cons: May take a little bit of time to adjust the straps. These are a great casual sandal to wear when you need some moderate support for your plantar fasciitis. The toe box is really wide so it has plenty of room for your toes to spread out. They also provide plenty of structure and support. This helps to redistribute the impact of your step as well as to keep your foot in a healthier position. Overall, it’s really got an impressive amount of support for a sandal. Which caught my attention during the research. Pros: Supportive, easy to wear, and roomy. Cons: Can be a little wider for women. Birkenstock is a pretty well-known brand at this point. They’ve been making amazing sandals with arch support for a while. The soles provide surprisingly good shock absorption for a sandal. The softer cushioning and the structure help to redistribute impact. This is an ideal choice for someone nearing the final stages of recovery. Their models have a low or zero heel drop which helps you build up natural foot strength but the cushioned sole still provides some protection. Pros: Good shock absorption, great for regaining strength in your foot. Thanks to the Orthaheel technology, Vionic sandals are another great choice for plantar fasciitis. Their design has an elegance and style that you just don’t usually find in a shoe that is built primarily for functional purposes. Where most sandals have a zero heel drop, most of the Vionic with Orthaheels will elevate your heel. This helps to protect your heel from impact. The foot bed also has extra cushioning. And the structure helps provide great support without making the sandal look bulky. Pros: Awesome arch support, extra cushioning, lots of great styles and designs. Keep in mind that for maximum support, the best solution is the walking/running shoes I mentioned above. Slippers with arch support should be an alternative for when you take off your shoes at home. Especially if your alternative is no footwear at all. Although here on Fixmywalk we placed only one image per slipper, all the slippers below are the best for both genders. The Spenco supreme slides have all the cushioning and support that slippers for plantar fasciitis need. Both the men and women’s line come with orthotic arch support and a compression foot bed that molds perfectly to the shape of your foot. The soles are cushioned to prevent pain from impact. But at the same time, the bottom is smooth enough not to mark up your floor like a normal shoe would. Pros: Compression molded foot bed and padding provide maximum comfort. Very positive reviews from people with plantar fasciitis. Cons: The arch support may feel odd for someone with neutral feet (no pronation). Orthofeet is another great brand for orthotic slippers. These are designed for people with foot pain caused by plantar fasciitis, diabetes, or arthritis. In all cases, the impact on your heel can not only cause severe pain across your foot but also all the way up your ankles through to your knees and even your hips. So this slipper deals with that by adding even more cushioning and support to the heel. What’s even more interesting about the design is that it actually uses air to cushion the steps. Basically, you’re walking on pouches of air. This adds a natural spring to your step so that you never plant your heel right into the ground. And by using air instead of foam or another padding, the whole slipper is lighter weight so it won’t strain your foot. Pros: Very low impact, lightweight design, and awesome support. Cons: The sizes run small but the slippers stretch out with use so it can be tricky to get the right size that will fit well the whole time. This model from Haflinger is a very cozy and comfortable slipper that I found in my research. What I really liked about it is its low maintenance. When they get dirty, you can just throw them in the washing machine. This is not always possible with orthotic slippers since they are made with materials that can warp and deform in a machine. The heel is extremely well supported with thick cushioning to minimize impact and protect the heel (along with the ankles, knees, hips, and lower back). The sole also provides arch support with a latex mold. Pros: Fit great and very comfortable. Cons: Not as much support as you might want from an orthotic. The Vionic Relax Slipper is an excellent slipper for people with foot pain of any kind. The footbed is fully and thickly cushioned from heel to toe. At the heel, it’s molded to contour around the heel, helping provide gentle support. There’s also additional cushioning here for maximum shock absorption. At the toe, the open design is ideal for allowing your toes to spread out naturally as you walk. And the sole is flexible and comfortable enough to let your foot move naturally while still protecting it from the full impact of walking. Pros: Extremely comfortable, great shock absorption, and good support. Cons: Must be cleaned by hand, not machine safe. Keep in mind that for maximum support, the best solution is the walking/running shoes I mentioned above. Dress shoes with arch support won’t be a great idea when you’re dealing with severe pain. For most people dealing with plantar fasciitis, it seems like you have to choose between comfort and style. Getting proper support and foot alignment seems to mean wearing a big, bulky unattractive orthotic shoe. This beautiful wedge pump from Vionic proves that isn’t true. There are 5 different color and style options. But most importantly, the foot bed is padded and shaped to provide better arch support and shock absorption than you could ever dream of getting from a normal pump. Pros: Great blend of orthotic support and style. These adorable flats look like your normal everyday shoe on the outside. But the 8 different styles and colors disguise an orthotic foot bed that provides wonderful arch support and cushions your step for better shock absorption. While most flats tend to be too minimal in terms of support for someone with plantar fasciitis, it can be tough to resist a cute pair of flats because they are just so easy to match with different outfits. Now you can enjoy the minimalist, cute style of a flat while still getting the support you need for plantar fasciitis. The outer sole provides some additional padding and shock absorption for the heel and the toe for that last touch of support that you need. Pros: Orthotic support and better shock absorption. Cons: May not be enough arch support for some people. The Luma model from Naot is an absolutely stunning pump that will have people completely fooled. You can’t tell at all that they are orthotic from the appearance. Naot has found an excellent way of subtly adding in comfort and cushioning features without making the shoe look bulky. There’s extra padding all along the foot bed. And what’s more, that padding is made with memory foam that will mold to your foot shape. It also features a heel cup to help with redistributing impact around the heel rather than letting it shoot straight through. Pros: Amazing style with well-disguised comfort. This loafer from OluKai has a uniquely stylish design. You can choose from 10 different colors, all of them made with high-quality leather. The footbed is contoured to provide better arch support than a normal loafer. And the heel offers excellent shock absorption that makes these comfortable enough to stand on your feet all day. This model is also great for people with wider feet or who need more room in their shoe as these run a little on the wider side. Pros: A fantastic loafer with shock absorption and comfort. Cons: Minimal arch support as compared to an orthotic (but there’s room to add inserts). Vionic is one of the best brands in orthotic shoes that are still stylish enough to wear with confidence. This casual men’s shoe is yet another example of what this brand can do. The sole is perfectly designed to help support proper foot alignment while providing great shock absorption. And the foot bed has adequate cushioning, especially in in the heel. It’s a great lightweight shoe with enough cushioning to keep your foot comfortable throughout the day. Pros: Light weight, great shock absorption, and cushioning. Cons: Less overall support than some of Vionic’s other shoes. This shoe from Orthofeet leans a little more on the side of comfort than style but it still is good looking enough to wear to work. It may not pass the test for a formal event but, then, few orthotic shoes will. As far as plantar fasciitis goes, though, it is ideal. The foot bed has thick cushioning, great arch support, and extra shock absorption built into the heel. It’s got 4 layers of perfectly designed materials which each help to minimize shock to your foot. Pros: Provides the best support and comfort compared to the rest of the shoes in this section. Cons: Not as stylish as some of the other orthotic dress shoes on the market. Although we placed only one image per shoe, all the shoes below are the best for both genders. These sneakers from ASICs are really unique in that they are form fitting from top to bottom. You’ll find plenty of orthotics that form fit to the bottom of your foot. But this shoe also has form fitting features on the upper part as well. A padded tongue and collar as well as a flexible fitting upper lets shoe form perfectly to your exact foot. The cushioning in the heel and toe is gel which is absolutely fantastic for shock absorption. And having it placed in both heel and toe means that you are protected from impact when your heel strikes the pavement and when the ball of your foot does that final push down before springing up. Pros: Fantastic shock absorption and custom fitting. Cons: Toe box is a little on the narrow side. As you probably know, New Balance has a history of making great sneakers for plantar fasciitis. The C806 model has cushioning in the sole that is designed for maximum shock absorption. The extended tongue and a redesign in the eyelets for the laces have also helped to prevent excess pressure on the heel and ankle. Your foot will feel supported, not constrained. The toe box is wide enough to let your toes spread out as they need to. Cons: Sizes run a little narrow (consider buying a ½ size up). The Zoom Vapor from Nike is another great tennis shoe for plantar fasciitis. It has this holistic design that allows every part of the shoe to work together to provide maximum comfort and support that is customized to your foot. In the midsection, for example, the material wraps all the way under your midsole so that you can lace up and provide a more customized arch support to your needs. The foot bed and sole offer excellent shock absorption. And the whole structure of the shoe helps to optimize your foot alignment while allowing you the flexibility to move your foot in any direction safely and securely. Pros: Extremely stable and great support. Cons: May need to add orthotic inserts if you need a higher level of arch support. The shoes below refer more to heavy work boots for physical work. If you’re looking for a more casual type of work shoes just pick one from the walking shoes above. Timberlands are generally a great brand to turn to for boots. And the Pitboss 6 model provides the kind of support that someone with plantar fasciitis needs. It’s designed to protect your foot for extended periods of time on your feet. So the sole will minimize the amount of shock from your step. And it will provide support for your arches as well as your ankle. This will help prevent you from over or under pronating—which is another cause of plantar fasciitis. Beyond that, it also has a roomier toe box which allows your toes to spread naturally. These are great to wear for extended periods of time. Pros: Awesome support and shock absorption for a boot. Cons: A little bit stiff, less cushioning. The Catalyst VX is another great example of a work boot that can also provide the comfort and support you need if you suffer from plantar fasciitis. It’s a taller boot which makes it a great choice if you are an over or under pronator because it will hold your ankle and prevent you from rolling your foot into an unnatural and painful position. It also provides great arch support and the sole is well designed to absorb and redistribute shock so that your heel stays safe and pain free. On the whole, this should be a great shoe for regular use. It may not be supportive or cushioned enough for severe pain. But for moderate pain or for helping you work toward full recovery, this is a great choice. Pros: Great support and comfort for when you have to be on your feet for extended periods of time. Cons: Not enough support for recovery from severe plantar fasciitis. The WO2421 from Wolverine would make a perfect everyday work shoe. It has a great structure that provides a lot of arch support. And, unlike some work boots, this one actually has a decent amount of cushioning. You’ve got extra cushioning around the collar, too, which helps provide extra ankle support (great for over or under pronators). It’s also roomy enough that you can put in your own orthotics during days when you need more support than usual. Pros: Great arch support, and shock absorption. Cons: The sole is a little bit stiff. The TR102 might be the best boot for plantar fasciitis that I have come across in my research. It provides amazing arch support. The heel has extra padding to cushion the impact and absorb the shock. There’s a removable molded insoles that provide extra support when needed. And the overall structure is ideal for making sure that your foot stays in a healthy position. But at the same time, it has a lower heel drop of just 2mm. This makes it great for those who are ready to move to a lower category in order to start rebuilding the natural strength of their foot. Pros: A lot of great structure and support but still flexible. Cons: Heel drop is too low for someone with severe heel pain. There are a lot of great features about the Rigmaster model from Timberland. It’s intended for people who work on their feet all day. But a lot of the features that go into a good work boot are also very beneficial to someone with plantar fasciitis. For starters, there’s extra cushioning in the foot bed. The sole is also designed in a way to help absorb shock and prevent the impact from damaging your heel. And the toe box is wide enough to let your toes spread out as much as they need to. Plus, the laces have quick-release hardware so that you don’t have to spend all that time lacing and unlacing your boots each day. That doesn’t do much for plantar fasciitis but it is definitely convenient! Pros: Fantastic shock absorption and support. Cons: Stiff structure, not a lot of flexibility. As I mentioned in the introduction, Plantar fasciitis is mainly caused by wearing shoes. When you are wearing shoes and orthotics, especially the most supportive ones, your feet “aren’t working” to support itself. Therefore, with time, this weakens your feet. Then, when your feet are weak and cannot support themselves, they can’t absorb the shock created from walking and running. And this causes your plantar fasciitis to occur in the first place and then to come back again and again! The longer you wear supportive footwear, the weaker your feet would become. During severe or constant plantar fasciitis pain you need to wear “top supportive” shoes. You can find those in the walking/running sections above (Typically any shoes with support level 7-10 are great for this stage). Meanwhile, I highly recommend using toe spreaders to fix your feet mechanics. Here are my favorites. It’s best to wear them while you sleep. In addition, make sure to do proper exercises and stretches for plantar fasciitis. In this stage, I highly recommend walking barefoot on grass/sea sand from time to time. It’s better for your feet than any of the minimal shoes above. Pour a thin layer of water into a shallow pan. Step onto a shopping bag or a blank piece of heavy paper and stand on that leg. Look at the shape of your footprint and compare it with those at the bottom of the picture below. The main job of a recovery shoe is to provide great arch support and proper cushioning to the heel. You want to minimize the impact to your foot that happens when walking. And you want to gently hold your foot in a proper position to correct improper walking gait. Cushioning in the sole decreases the pain from the impact. And cushioning in the upper part helps to hold your foot in a healthier position and prevent improper pronation. Heel drop is a term used to refer to the incline in the shoe. That is, how much is your heel raised above your toes. A shoe with zero heel drop would mean that your heel and toe are level and your whole foot forms a flat line. A higher drop forces you to land in the middle or front of your foot. This prevents you from slamming down on your heel as you normally would in a lower shoe. The bottom of the shoe is where you’ll find most of the features that decrease impact. What you want to look for is a stiff outer sole and a heel that is formed in a way that redistributes the shock of impact around the shoe. The toe box is the front of the shoe where, you guessed it, your toes go. It’s an often overlooked part but it is important. For plantar fasciitis, you want to make sure that it’s a bit on the wider side. Toes naturally spread out for balance and impact distribution when you walk. If the toe box is too narrow, they can’t spread as much as they need to. This puts a strain on your foot, weakens your toes, and can make plantar fasciitis worse. Now that you know what kind of factors going into choosing a shoe for plantar fasciitis, it’s time to look at some real examples. I’ve done some extensive research, read through countless reviews, and compiled a list of some of the best shoes for plantar fasciitis to help you learn more about your options and find the right shoe for you! That’s it! PHEW… it was long. I put hard work creating and researching this massive guide for you guys. As you probably know, I’ve done an extensive research to provide you the best and most accurate information. Below I list some of the helpful sources I used while conducting this research. WebMD, Plantar Fasciitis – Topic Overview, Informational health site. Mayo Clinic, Plantar Fasciitis, Informational health site. Runners World, Plantar Fasciitis Release Technique, Informational running site, JULY 22, 2016. Competitor, New Techniques For Treating Plantar Fasciitis, Running magazine, Nov 16, 2016. Newton Running – Youtube, Running Form Friday: Plantar Fasciitis, Video, Mar 2, 2012. My name is Abby and I’m on a mission to give you simplified and actionable foot health advice, running tips and footwear reviews.My wonderful team and I work hard to provide you the most actionable and up-to-date information.I wish you all the best on your health journey!